Each year on Ag Day, Massachusetts farmers and agricultural groups bring a taste of Massachusetts farming to the State House in Boston. Featuring lots of great local food and real discussions about Massachusetts farms, Ag Day is an opportunity to engage lawmakers on issues important to the agricultural community. 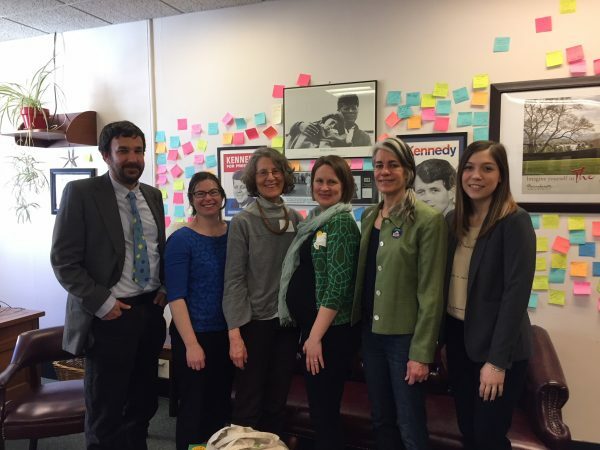 CISA staff members meet with State Reps from western Massachusetts to remind them about the importance of Buy Local funding, ask for their continued support for our Senior FarmShare program, and advocate for the farming community’s legislative priorities. With help from Local Hero members, we source ingredients to highlight the local bounty farmers in this region provide for residents in the state. Through funding for the state’s Buy Local campaigns, CISA has been able to expand our outreach to consumers through our successful Be a Local Hero, Buy Locally Grown® program. Local business members overwhelmingly say that participation in this program leads to increased revenues and national research suggests that areas with active Buy Local campaigns have more robust sales, even in times of economic weakness. Download the Coalition’s full legislative proposal. Through the Senior FarmShare program, CISA provides over 400 low-income seniors in western Massachusetts with heavily subsidized access to 10 weeks of fresh vegetables grown by local farms. Download the 2019 Senior FarmShare factsheet. The Healthy Incentives Program, which doubles the value of SNAP recipients’ purchases of fresh fruits and vegetables directly from farmers, improving health outcomes for vulnerable communities and increasing sales for local farms. CISA is asking for funding to allow the program to run year-round without interruption: $8,500,000. Download the HIP factsheet. The Healthy Incentives Program doubles SNAP recipients’ purchases of fresh fruits and vegetables directly from farmers, improving health outcomes for vulnerable communities and increasing sales for local farms. This bill will establish the framework for the program’s long-term sustainability. This act would establish a healthy soils program, which shall seek to optimize climate benefits while supporting the economic viability of agriculture in the Commonwealth by providing incentives, including, but not limited to, loans, grants, research, technical assistance, educational material, and outreach to farmers whose management practices will contribute to healthy soils and agricultural innovation and result in net long-term on-farm greenhouse gas benefits.